"Weather doesn't follow geopolitical boundaries," said retired Air Force Brig. Gen. David L. Johnson, director of the NOAA National Weather Service. 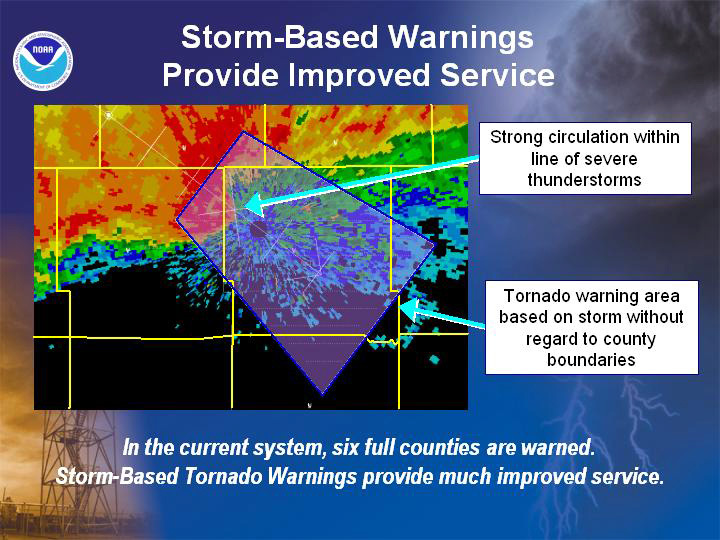 "Storm-based warnings provide the public with more specific information about the location of severe weather and the direction it is expected to move. Seconds count during tornadoes and flash floods. We want to provide the public with the most accurate description of what's happening in their neighborhood. We also want to avoid warning non-threatened portions of the county." When issuing a warning, the NOAA National Weather Service will specify areas within a county and refer to commonly known landmarks such as highways or rivers. 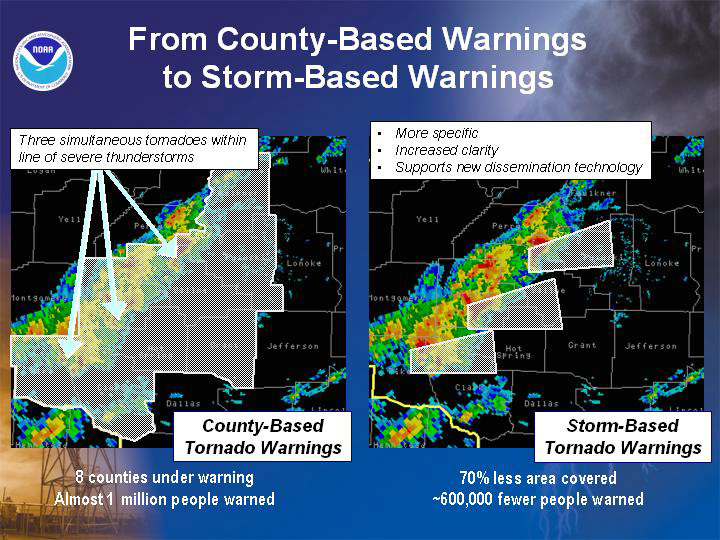 The new warnings will take effect October 1, 2007. NOAA, an agency of the U.S. Commerce Department, is celebrating 200 years of science and service to the nation. From the establishment of the Survey of the Coast in 1807 by Thomas Jefferson to the formation of the Weather Bureau and the Bureau of Commercial Fisheries in the 1870s, much of America's scientific heritage is rooted in NOAA. NOAA is dedicated to enhancing economic security and national safety through the prediction and research of weather and climate-related events and information service delivery for transportation, and by providing environmental stewardship of the nation's coastal and marine resources. Through the emerging Global Earth Observation System of Systems (GEOSS), NOAA is working with its federal partners, more than 60 countries and the European Commission to develop a global monitoring network that is as integrated as the planet it observes, predicts and protects.